As I mentioned previously, the spanakopita (spinach pie) is quite delicious at Boubouki, and I’m happy to report, the sweets are as good as well. For people who find baklava too sweet, you’ll like Boubouki’s version (pictured above; $4) which is sweet, but not tooth-achingly so. 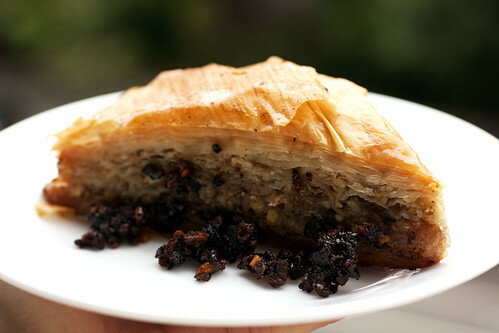 The layers of phyllo interspersed with layers of ground walnuts are crisp at the top and are more drenched with honey as you get to the bottom, but unlike most Greek bakeries, the bottommost layer isn’t honey-logged beyond oblivion. For added crunch, each piece of baklava comes with a few spoonfuls of dark caramelized walnuts. The bad news? Baklava is only served on the weekends. Alas, I’ve never seen the carrot cake ($4) on the weekdays either, and it’s really unfortunate because I may like it as much as the baklava. 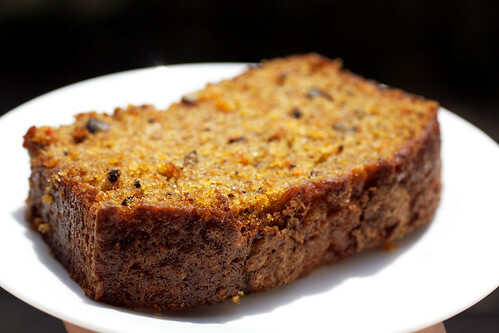 Made with shredded carrots, black walnuts, cinnamon, and a bit of orange zest (Rona Economou, the chef and owner, seems to be a real fan of the latter), the cake is moist, lightly spiced, and delicate to the bite. There’s no cream cheese frosting, and it’s not very sweet, making it less suitable for dessert (although it would work for me), but it’s perfect for an afternoon pick-me-up along with a cup of tea or coffee. It works for breakfast as well. Don’t worry about it drying out overnight if you buy it in the evening, it’ll be just as moist in the morning. And if by some odd chance it’s not, that’s what butter was made for. What to do on the weekdays then? Well, no need to neglect your sweet tooth. 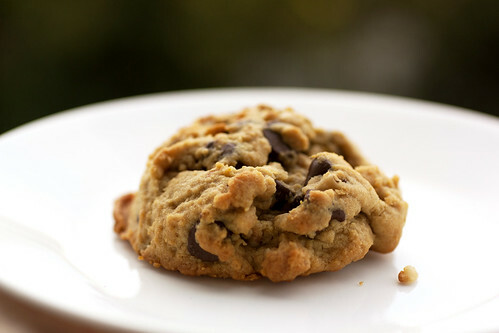 During the week, you’ll find big, fat chocolate chip cookies ($2) studded with walnuts, sweetened with grape must (molasses), and flavored with orange zest. The towering lumps look pretty hearty, but the cookies are actually light-tasting due to the bright zest and the soft texture. I’d even say the cookies tasted healthy, but I won’t lest people be turned off by the word. What I will say is that you can eat one or two without feeling too guilty. This is important. Especially when a weekend filled with baklava and carrot cake beckons.